The Immigrants' Assistance Center was established in 1971 by members of the local Portuguese community of New Bedford, with a mission to, "Help immigrants to overcome language, cultural an economic barriers." "Today, the IAC serves as the point of access to every type of social service that is publicly available to the Greater New Bedford Area. Our Center helps non-English speakers access information and services for any problem or need. The IAC is a vital link between the non-English speaking community and all of the other public and private human service agencies and providers in the area." It takes no stretch of the imagination to understand that the need for IAC's services has increased substantially in the last year. We can help. 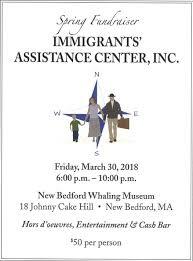 There's a fundraiser at the Whaling Museum this Friday, March 30. Tickets are $50 per person, the venue is beautiful, the event promises to be a good time. This meeting will launch our Adopt a Candidate program! You'll hear more about the candidates and districts that we chose through the voting that concluded on March 15. And you'll have the opportunity to volunteer for one of our candidate teams. Please plan to attend, and bring a friend. The effectiveness of our efforts to support strong Congressional candidates depends entirely on you. The more 'people power' we have, the more we can do. Even if you only have a limited time to work with us, you can help and make a difference! Thank you.